On Wednesday 25 November organisations from Camden and Islington came together at City University to hear about air quality initiatives which would improve the local environment and employee wellbeing, as well as cutting energy and transport costs. With air quality in some parts of London being the worst in Europe and news announcing that nearly 9,500 people die early each year in London due to long-term exposure to air pollution, air quality is becoming a priority for the city. Speakers at our Air Quality Seminar highlighted how some parts of Camden and Islington are particularly affected by poor air quality, including Euston Road, and explained how businesses, residents and visitors to the borough could limit their exposure to the pollutants. Major sources of air pollution come from combustion as a direct result of transportation and heating. Speakers showed how business can make carbon reductions, energy efficiencies, and transport savings from supporting air quality initiatives, as well as enhancing employee wellbeing and making the working environment healthier. Camden Council, giving an introduction to the issue and talking about Council and London-wide initiatives to manage air quality. Below are some of the initiatives discussed at the event which businesses can be involved in. Nigel Symonds from Camden Council presented on a joint Freight Consolidation Scheme run by Camden, Islington and Enfield Councils. The scheme consolidates business deliveries into one centre in Enfield and brings them to businesses through fewer deliveries using low emissions vehicles. This results in fewer vehicles on the road and therefore reduced air pollution and congestion. It also means cost and efficiency savings for businesses as they are not required to deal with multiple incoming deliveries, as well as opportunities to temporarily store stock at the consolidation centre. Businesses can sign up to the Freight Consolidation Scheme – for more information contact Nigel Symonds: Nigel.Symonds@camden.gov.uk. Uto Patrick from the Clean Air Better Business programme (CABB) spoke about initiatives which have been run with local organisations and Business Improvement Districts which improve the local air quality as well as providing wider business benefits. CABB is supported by the Mayor of London and aims to raise awareness of air quality and engage businesses to take action and implement low pollution transport initiatives. Some of these initiatives include consolidating deliveries, providing eco driving training, preparing businesses for the shift to an ultra-low emissions zone, implementing a pool bike scheme for local businesses, and designing a ‘Wellbeing Walk’ route away from high pollution areas between Kings Cross and Euston. For more information on the initiatives being run and to see how you can get involved please contact Uto Patrick: UPatrick@lambeth.gov.uk. From 2020, all cars, motorcycles, vans, minibuses, heavy goods vehicles (HGVs), buses and coaches will need to meet exhaust emission standards for Ultra Low Emissions Zones (ULEZ) or otherwise be liable to pay an additional charge (depending on vehicle type) when travelling within the ULEZ. 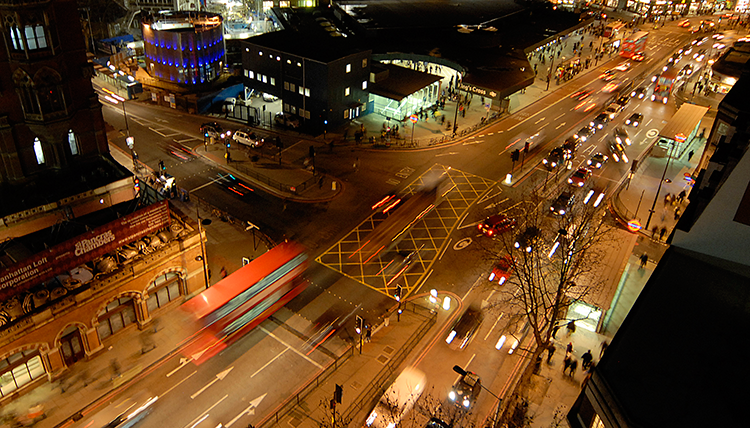 ULEZ covers the same area of London as the Congestion Charge Zone and it will operate 24/7. There will be cameras located within the ULEZ to check number plates of vehicles driving within that zone. Vehicles will be checked against a database so see if they meet the ULEZ standards, if they do not then they will need to pay the charge. To protect human health, the European Union has set legal limits for concentrations of pollutants in outdoor air, including particulate matter (PM10 and PM2.5) and nitrogen dioxide (NO2) in London and the UK. ULEZ is being introduced because London has breached EU limits for concentrations of NO2. It is expected that ULEZ will reduce levels of NO2, PM10 and PM2.5 in London, improving health for all, in particular those more affected by air pollution. ULEZ will also support wider climate change targets and is part of a host of measures to promote sustainable transport. It is anticipated that the positive effects will be seen beyond the ULEZ to Greater London. TfL provide details on what vehicles are affected by the ULEZ. FREVUE (Freight Electric Vehicles in Europe) is an initiative led by Cross River Partnership and operates in 30 European cities, including London. It aims to increase the uptake of cleaner and more efficient freight solutions, including electric vehicle trials and delivery consolidation centres. The Clean Air Better Business (CABB) programme is part of this initiative. Visit Cross River Partnership’s website to find out more. By signing up, you will receive our newsletter with updates on your local climate alliance, and information to help improve your organisation’s environmental performance.